The new Digg has gotten a lot of attention for the opportunities it creates for publishers (see ReadWriteWeb and BlueGlass for details). First and foremost is the ability to create official profiles and automatically submit content, which publishers are hoping will turn Digg into a friendlier place for mainstream media. But how will users respond to the new format? Do they want to follow and interact with specific media sites? Or will publisher profiles end up full of self-submitted stories with only one digg (their own)? Now that the alpha version has been going for a while (update: the new Digg v4 went live to everyone on August 25th) I thought I’d take a look at how news organizations are faring thus far. Using the new Find Profiles page (it is behind the login wall so I won’t link to it) I went through the World News and Business categories to look for major news sites. The New York Times has the most followers with The Wall Street Journal and BBC News close behind. Currently only seven of the 30 sites have crossed 2,000 followers but The Washington Post, The Los Angeles Times and USA Today are getting close. You have to feel for The Economist, Chicago Tribune and United Press International down at the bottom of the pack. You’d think UPI could at least attract a follower or two from its own organization. 🙂 To be fair though there are quite a few other profiles in the World News category with few or no followers that did not make the table. 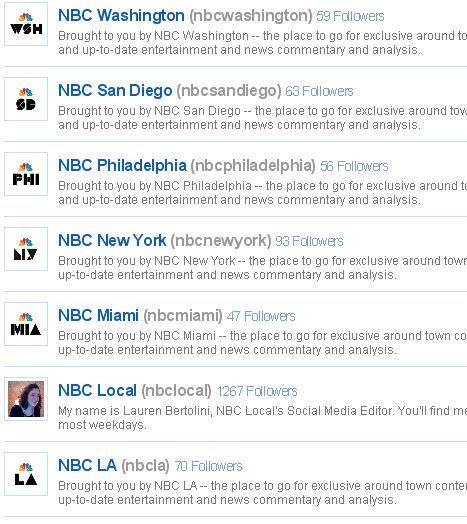 (For example Phoenix New Times, WGNTV and Seattle Weekly all have 0 followers as of today). Time appears to have the most active profile. They are following 964 people (far more than any of the others) and have dugg over 6,000 submissions. They also made 29 comments; that’s a very low number but most of the other sites have not made any. I did not see a main profile for Fox News in the World News section but they do have a profile in the Business section (foxbusiness). In cross checking against the news sites in my posts on Twitter impact and Facebook Page valuation I also did not see Digg profiles for Newsweek, ABC News, AP, NPR, PBS, The Financial Times or The Guardian. I couldn’t find them through Digg’s internal search either; if I’ve missed one or there are other major news site profiles that you are aware of please let me know. 1) It is not clear yet how well using an RSS feed to automatically submit articles is working. In going through the various profiles I saw a lot of submissions with just one digg. It will be interesting to see if sites that auto-submit in volume will end up drowning out the select articles from their site each day that have a better chance of attracting diggs. 2) I did not include sites from the Technology category but several in that group have attracted decent followings including Engadget (24,011 followers), Gizmodo (17,546) Mashable (14,528), Wired (9,695) and Ars Technica (7,724). While it is not surprising that tech sites are doing well it is encouraging that some of the top mainstream news sites above fall within in the middle of this group. This may help to attract more followers overall since users will be able to drill down on the specific topics that they are interested in. 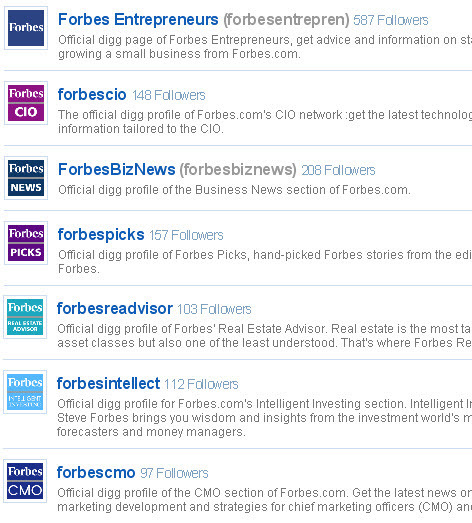 But there is also a risk that Forbes will spread itself too thin and weaken the value of its main profile. The market-specific logos all match so this appears to be a coordinated effort. After six months of negative response from users, low engagement and abuse by spammers Digg has decided to discontinue RSS auto-submissions for publishers. 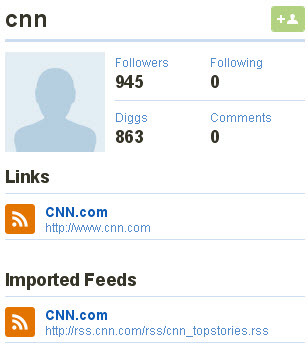 According to Digg product manager Mike Cieri only 4.5% of all Top News content came from RSS submissions. 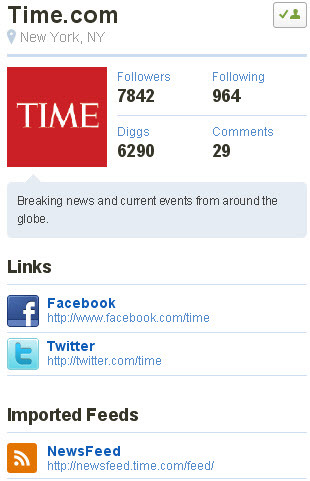 See Mashable for the details: Digg Bans RSS Submissions. Hi Adam, this was an excellent post, and I’m glad you worked with Neil Glassman to get a guest post version up at socialtimes.com. I’m not sure if you’ve seen it, but this exploded onto Digg’s front page and has sparked a discussion about the benefits of the new Digg. Congratulations! Thanks Neil. I’ve actually been out today but I’ve been trying to check in on the Digg discussion from my phone. I’m glad to see it’s sparked so much discussion. I read this post on Social Times, but wanted to comment here. I think you’ve done a great analysis, Adam. I hope you continue it and check things out as the alpha version is rolled out for everyone and becomes more mainstream. I agree with you that the “insert your feed” option will result in more average stories, with only 1 or a handful of Diggs. Media accounts might be better served by avoiding the auto-submit option and instead choosing the content that is more likely to have a wider appeal. I also think that might result in some users un-following the media outlets that auto submit. For instance, I personally like the Huffington Post, but I don’t want the “My News” feed to be saturated by the five million stories they churn out each hour. Why do you think it is that none of the media accounts actively contribute to the discussion, as you pointed out, with comments and Diggs themselves? Is it because the “media makes the news and does not participate in it” kind of a mentality? Thanks John. I agree that auto-submitting everything could end up doing more harm than good for many sites, for both of those reasons. Creating a Digg-specific feed that includes only select content might be the best approach. As for the lack of commenting from media profiles, I think part of it is that the system is still very new and most haven’t fully thought through how they want to approach it yet. Also news organizations are understandably being cautious while they see how users respond to the new system. And part of it too is that active participation and engagement is time-intensive, and not everyone wants to devote resources to that. Once some more time passes it might be interesting to compare the results of more active and personalized profiles vs. those that do nothing but submit their articles. Hey, loved the article on Digg4. If your readers enjoy Digg4, they may also be interested in quippd: http://quippd.com, which is similar to Digg4 in many ways (we went live first!). We don’t have an RSS import functionality, but we are looking into it. Feel free to ask me any questions, I’m subscribing to follow up comments via email. Connor – there’s been quite a bit of negative reaction from the users since v4 went live, so you’re not alone there. Hopefully Digg will come up with a system that works for all concerned – well established users, newer and less active users and the media outlets themselves.